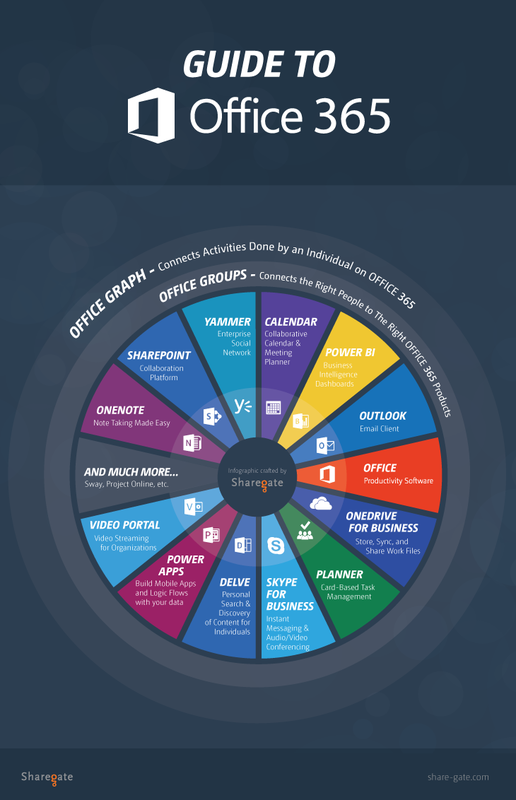 Think you know what’s in Microsoft Office 365? If you’ve heard of Microsoft Office 365 but are a bit vague as to what EXACTLY it includes, or what you can do with it, then look no further! Today on the Glemnet blog we’re going to delve further into some of the functions of this great cloud-based service, that means you can operate and have great productivity from wherever you’re working from. Office Graph connects activities performed by individuals in the entire Office 365 Suite, and goes a step further by learning from them. Delve, a tool that leverages Office Graph, for example, can predict what files you may be looking for, and display them, before you even search for them. Additionally, we can go beyond individual products, using Office Graph to create apps, or to give us different ways of looking at our digital workplace as a whole. Your “Recent Documents”, for example, wouldn’t just be your SharePoint recent documents, but all of them in the Office Suite. These are displayed much like your old security groups, but will be much more powerful and connected. Office 365 Groups is a way of grouping individuals logically, much like any other group you may have used before – but the difference lies in how it integrates with Office 365. When a group is created, Office 365 Products are automatically attributed to that group in a way that makes the most sense. It acknowledges that not everyone in an organisation works the same way, and that every team or project doesn’t always fit in a specific product. This way, when you create a team or “Group”, products will be attributed, and that team can choose what to use for their particular needs. They might choose to start with an Outlook calendar and Yammer, and eventually incorporate Planner, as well. The combinations are vast, and the major benefit is that these products are all linked to the group. The usual Office Suite you’re familiar with. Open and edit documents you want to work on. Most Office 365 plans include the Office client in their subscription. Needs no introduction but, as we move forward, it’s important to split the Mail functionality and the Calendar into two. A platform for you to build what you need to work with your content. Generally used to build Intranets, Extranets and Collaboration Team Sites for people to work together more intelligently. It includes Workflows and many more features that makes it great for planned ECM deployments. Furthermore, with the release of the latest version (2016), organisations are migrating to SharePoint Online on Office 365 with renewed vigor in order to benefit from its powerful new features and functionalities. Renowned note taking app that facilitates working as a team within a notebook. Originally called Lync, this is an instant messaging and audio/video conferencing tool. Great for PowerPoint presentations to people not at the office with you, online meetings, as well as regular phone calls. Has also recently added a broadcast feature to allow up to 10,000 attendees to be viewing the feed. The place individuals go to see, and work with, their files. OneDrive for Business includes a personal document library for every user to store their files, much like the old My Documents folder or Home Drive previously used. It also allows individuals to see all recent Group Files from one location. Lastly, it includes a Sync Offline tool, which allows users to continue working when a connection isn’t possible. An Enterprise Social Network to help businesses have open conversations. Allows you to create groups and, within them, threaded conversations. Built on Office Graph, it is meant for Personal Search and Discovery of content for individuals using Office 365. It includes new People Profiles, and information such as the org chart. It uses Office Graph and machine learning to show you content in a card-based feed intelligently, as well as allows you to group them into boards. Delve is also where the new Office 365 Blogging feature is located, providing individuals with a responsive and easy-to-use interface to tell stories. An easy way to connect your data and create beautiful and interactive dashboards. Whether you have information in SQL, SharePoint, or even an Excel file, Power BI will help you see more from them. A card-based task manager, Planner allows you to organize your tasks into cards, and show their progress, by moving them from left to right into appropriate columns. For example, you could have columns titled “To-Do”, “Doing”, “Blocked”, and “Done”. Then, using cards to represent your tasks and linking content within them, as well as assigning people to them, you move them from “To-Do” to “Done” as they progress. Not necessarily a part of Office 365, but plays a big part in it. Power Apps helps you create Workflows on your content stored in various data sources including SharePoint and OneDrive for Business. It also helps you create mobile apps easily that connect and talk to SharePoint and other Office 365 products. A place for the organisation to store video content and automatically stream it on all devices and browsers. The Video Portal leverages Azure Media Services to do all the hard work for you, all you have to do is create channels and upload your videos. The mobile apps also allow you to record and send your videos directly to the right channel. The outlook calendar to organise events and meetings. Tell me, now that you know what’s in Office 365, which is your favourite part?